Egyptian megastar Amr Diab will perform at Cairo Festival City Mall on Friday 30 November as part of his new album tour. 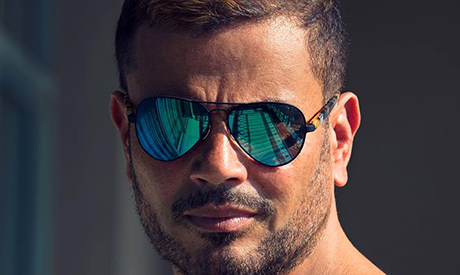 Diab, known to fans as “El-Hadaba”, will be performing a selection from his latest album Kol Hayaty (“All My Life”), released last month, in addition to some of his classics. Produced by Nay, typical pop tunes, composed or arranged for the singer, have become Diab's hallmark. The same style strongly dominates the new album with the usual piano chord progressions, string section themes accompanying guitars and solo oriental instruments, with electronic beats powered by various percussions with slight experimentation with virtual sounds. The highlight of Kol Hayaty, most of it written by Saudi sports tycoon Turki Al-Sheikh and composed by Amr Mostafa, includes the collaboration with American electronic-music producer Christopher Comstock, known as Marshmello, on the song In Love. The same venue will host Tamer Hosny, whose fans like to compare to Diab, two weeks earlier. Diab has also announced he will perform at Rixos in Sharm El-Sheikh on 30 December. Diab, who was listed ninth in this year’s Forbes ‘Arab Stars On The Global Stage’ listing, has a worldwide fan base. He has held concerts largely in the UAE and Egypt over the last three years. He won the World Music Award for Best Selling Artist four times, with the last one for his 2013 album El-Leila (“Tonight”), which also garnered him many other awards. Diab is the only Middle Eastern artist to receive a World Music Award seven times.